"4am and we're finally done! Thanks so much, Bala Menzies for helping out tonight (and please thank Tarsh for going without you). Thanks too to Evelyn Peglar for getting 20 guys most of the way there, pretty much on her own. Now just to get my TV star husband Sam Campbell to stop painting battlefield detritus and go to bed... Goodnight world." This was part of the last wrapping up of painting that is currently going on. Whilst most of the figures that were sent out were painted and returned, we unfortunately did get some returned without having even been touched. Unfortunately, some of these were particularly important figures, so it has been a real 'all hands to the pumps' effort here in Wellington to get them done. Even young Mortimer had to be drafted in to do his bit to finish the figures! Sam delivered the miniatures to The Great War Exhibition today. "The display is looking amazing with thousands of miniatures already on there," he says. "It has been a labour of love." This week he and his team have done an extreme amount of painting. On Sunday night they found all the bits and all the crews for all the machine guns. Six of them were missing their third leg, and six needed to be painted green. The Perry twins had also sculpted up some more machine gunners with some one-off greens. On Monday the team got all the rest of the stuff from out of town. They had to standardise 100 figures. 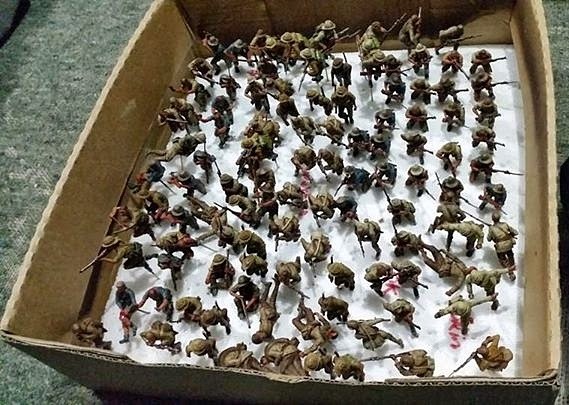 On Tuesday, they took another 100 other miniatures to fix up. "Big thanks to my wife, my kids and Bruce for helping out on the last push," he says. "It was nuts. Although we got a bit of a routine down for mass speed painting, which was effective and we learnt a lot of tips and tricks. Going to bed early to sleep off the painting marathon." 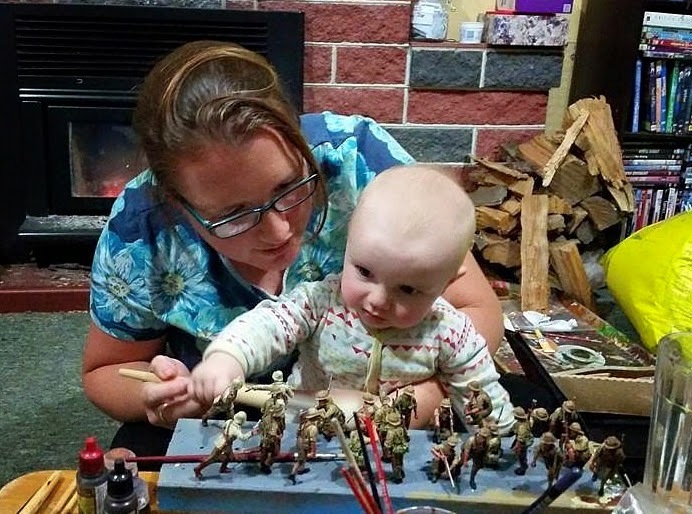 Sam finished off with the comment, "Thinking of collecting more historical miniatures now!" Amazing effort folks, and hats off to the Wellington/Hutt/Kapiti crew for their work over this past couple of weeks. I was proud to be part of it. Fantastic work Fern and Sam - well done. A great achievement. Well done - it was a pleasure working with you guys on this project. Congrats to the whole family.